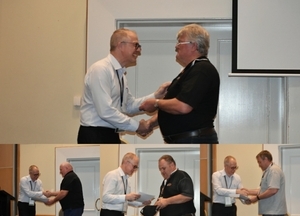 At the Wireless Institute of Australia annual general meeting held at Seaworld Conference Centre, a number of high achievers were honoured with the presentation of its annual awards. Ewan Mcleod VK4ERM from Kenmore QLD received the GA Taylor medal. 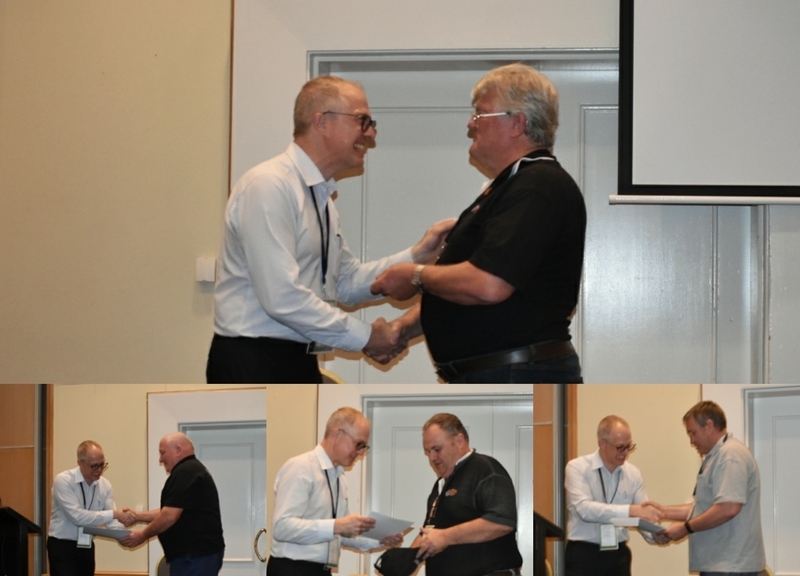 The GA Taylor medal was presented in recognition of exceptional service to The Wireless Institute of Australia. The GA Taylor medal is the highest ranking of all the WIA Merit Awards. In other recognition, for his work through promotion and training in Amateur Radio with the Radio and Electronics School, Ron Bertrand VK2DQ was awarded the prestigious Chris Jones Award. This award is in memory of Chris Jones VK2ZDD (SK) and is presented to radio amateurs who have made an exceptional contribution to amateur radio and the Wireless Institute of Australia. Trevor Quick VK5ATQ and Stuart Fillmore VK5STU who received the Al Shawsmith Award for the best non-technical article "VK5 School Holiday Technology Program is a Resounding Success" published in the May 2017 issue. Peter Gibson VK3AZL received the Higginbotham Award for service to the amateur radio community and for Peter's service to the WIA and the Publications Committee over at least 32 years, serving as the lead Technical Editor for most of that period. Jim Henderson VK1AT received the Publications Committeee Technical Award for his article "A 35 to 4400 MHz Signal Generator" published in the November 2017 issue. Peter Parker VK3YE for his prolific promotion of amateur radio in Australia, and making the hobby accessible to new and old through his YouTube channel and ebooks. Timothy Dixon VK5ZT for his work promoting his hobby, openly sharing his extensive modifications to microwave equipment and furthering experimentation in microwave and optical bands in Australia. Glenn English VK1XX for sharing his technical skills and knowledge to improve the hobby in a variety of technical fields. Joe & Julie Gonzales VK3YSP & VK3FOWL for promotion of amateur radio in schools, engaging youth and school communities, and sharing their projects and findings with the amateur community. Grant Willis VK5GR for his work with the WIA, contesting and in past advocacy within the IARU. Trent Sampson VK4TS for actively promoting contesting in Australia, engaging with clubs to improve their contesting skills and supporting contesting in Australia and the region. Paul VK5PAS for his work with the VK5 parks award, promoting WWFF and opening up an aspect of the hobby to the wider community. 16 WIA Assessors reached the milestone of 10 years of service conducting assessments, and those present were presented a Certificate and pin by the WIA Exam Service to mark the occasion. 10 year service awards were to Daniel Clift VK2DC, Brian Conner VK2ZBP, Mark Plowman VK2MP, Peter Burgess VK2ZZA, Edward Thrift VK2ARA, John Chenoweth VK3ZX, Ashley Clark VK3SSB, Rex Foord VK3ARG, Walter Cornell VK3FGC, Ewen Templeton VK3OW, Arnold Put VK3YAP, Andre Van Zyl VK3AVZ, Peter Schrader VK4EA, Cecil Kenny VK4CF, Stephen Reakes VK4QQ, Patrick Daley VK8ZMX.